Spoiler alert: none of these SUVs is the winner of Speed Week. Despite their best efforts, no carmaker has yet managed to engineer its way around the laws of physics. A bigger, heavier car is almost always less capable than a smaller, lighter one, and so it will remain until someone figures out how to make a chassis out of antimatter. Or candyfloss. But that’s not to say these three are here merely to make up the numbers (or because we couldn’t fit all of our camera gear in the 488 Pista). While none are quite right for the ultimate award, each is tremendous in its own way, and thoroughly deserving of a place among our favourite performance cars of 2018. Take the Urus. Ignore, for a moment, any philosophical objections you might have to a Lamborghini SUV – especially one that borrows so heavily from the VW Group parts bin. You should also ignore the way it looks – for it divides opinion like nothing else here – and what bystanders will inevitably think of you (and mutter to themselves) when you draw up outside your children’s school or the local supermarket. What you absolutely must not and indeed cannot ignore, however, is the way it goes. Lambo has deployed every last bit of technology at its disposal to make the Urus drive unlike any other 2.2-tonne SUV. The result is perhaps as impressive a technical achievement as any other car here – Chiron excepted. Rear-wheel steering gives it a virtual wheelbase shorter than a Huracán’s, so it swivels into Charade’s hairpins alarmingly purposefully, and the biggest carbon-ceramic brakes ever fitted to a production car (camouflaged behind massive alloys shod with the stickiest road-legal Pirellis available) give tremendous stopping power. Meanwhile something called ‘active roll stability control’ firms up the outside suspension in fast corners, all but eliminating body roll, while proper centre Torsen and active rear differentials combine to fling you out of corners without so much as a “Dio mio! Let us just think this one through” from the computers. The G-Class cannot do this. It may be built on an all-new platform (this, don’t forget, is the first ‘all-new’ G in the nameplate’s 40-year history), so the driving experience is now closer to that of a modern SUV than Scorpus’s chariot, but alongside the Lambo it still feels like a bit of an anachronism. Prehistoric traction control you can’t really turn off cuts power with little to no warning or, it seems, provocation, so you have to be super-smooth and incredibly hesitant with the throttle. It rolls, pitches on its springs under heavy acceleration and braking, and doesn’t much like quick direction changes. And yet… it is by far and away the most likeable SUV here. I defy anyone not to fall in love with the way it rears up as you accelerate (something I’m convinced Mercedes could have eliminated but chose not to), the machine-gun noises that emanate from its side pipes and its brutish, squared-off face. This is a car that is comfortable in its own skin, that doesn’t take itself too seriously. As lovable as the old G – which in AMG form was so wayward it verged on dangerous – but in another league dynamically. It might not be in the same realm as the Lambo, but this is still a G you can enjoy driving quickly – more so on (or off…) the road, where you aren’t going fast enough to expose its failings – something we never thought we’d live to see. We also didn’t think we’d ever live to see Alfa make an SUV, let alone one so good we’d want it on Speed Week. The Stelvio Quadrifoglio is based on the same platform and uses the same drivetrain as the fast Giulia, and you can instantly tell. It doesn’t feel in the least bit toned down or sanitised. You get the same super-sharp, super-quick steering, the same energy from the 2.9-litre Ferrari-developed V6, and, as the weight penalty is only about 60kg, the same balance and delicacy. 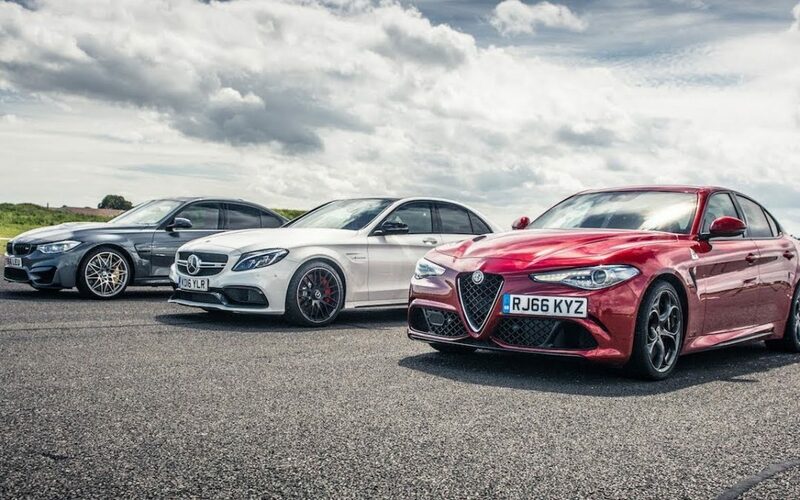 What the Alfa brings to this party of three is a degree of engagement and interactivity. The Lambo, though devastatingly fast, is recognisably from the “big, fast VW Group car” mould, in that it’s very locked-down. All about the speed and the grip… and the ease with which you can access them. The Alfa is a much more involving thing – more conventionally fun. Few SUVs feel quite as carlike as the Stelvio, which has a measure of daftness, like the G, but also a hint of that same kind of focus and purpose as the Urus. It treads a happy middle ground in this little cavalcade – none of whose manufacturers have completely bent physics to their will, but are getting mighty, mighty close. We will bring back the nostalgia of fabulous Alfa Romeo cars to Thailand.